Super members have suffered their second straight month of negative returns and are now firmly in the red for the financial year as market volatility and political uncertainty weighs on market sentiment. Nonetheless, super members remain well ahead over the long term with $100,000 invested ten years ago in any number of funds still worth more than twice as much today. 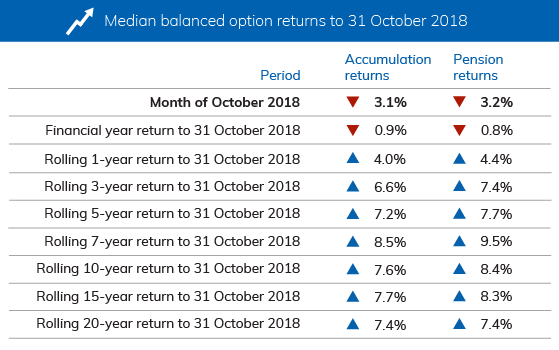 The latest data from superannuation research house SuperRatings reveals a decline of -3.1 percent in the month of October for members invested in the median Balanced option. However, because of stronger performance in July and August the losses for the financial year to date (FYTD) are lower at -0.9 percent. The decline has been more severe for members invested in the median Growth option, suffering a decline of -4.1 percent in the month of October and -1.5 percent FYTD. 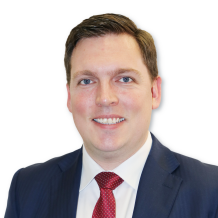 Members who had directed their investments towards Australian and international equities have experienced even greater declines with the median Australian Shares option down -5.7 percent in October and -4.4 percent FYTD, while those in the median International Shares option suffered a decline of -5.8 percent in October but just -1.1 percent FYTD. 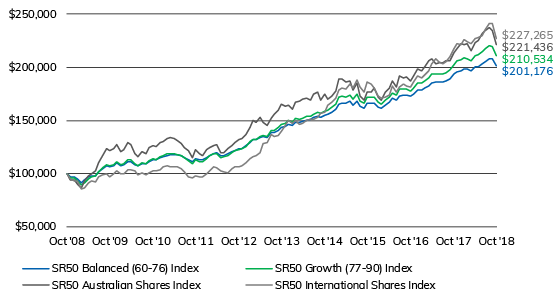 The performance of the International Shares option reflects the divergence in domestic and international markets over recent months. 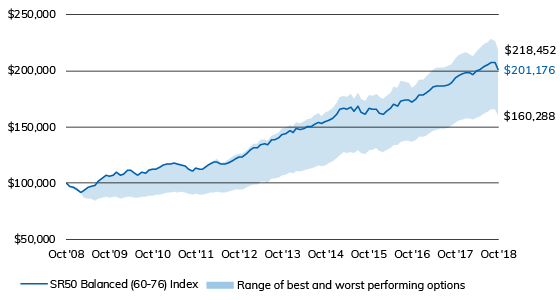 When considered over the longer term, the recent selling will not significantly diminish the stellar performance achieved by super funds over recent years. An investment of $100,000 in the median balanced fund 10 years ago would now be worth around $193,751 as at the end of September 2018. In the best performing balanced fund over that period, the same $100,000 investment would have doubled in value to $213,156. Copyright © 2018 SuperRatings Pty Ltd (ABN 95 100 192 283 AFSL No. 311880 (SuperRatings)).